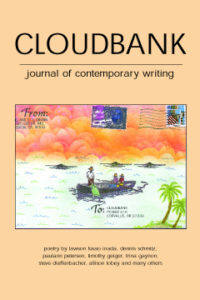 Cloudbank 3 includes poetry and flash fiction by Lawson Fusao Inada, Dennis Schmitz, Paulann Petersen, Timothy Geiger, Trina Gaynon, Steve Dieffenbacher and others. Rolling the Bones by Christopher Buckley, Fault Lines by Tim Hunt, and Moist Meridian by Henry Hughes are reviewed. As is often the case, less is more, particularly when the poet is able to create an impression more with a paintbrush than a pen. Words are used to create an image and, in the long run, we remember the image rather than the words. The image speaks for itself. danced to the voices of children. when we held our babies close and sang to them. in both hands and mold it to our hearts. even as its outline was all we remembered. around echoes of a seedless core. turning to creases in a cobbled road. the small sound of the bell.